Your account in our control panel. The domain control panel for the current registrar. Create (or update) contact details on your dashboard. Before any domain transfer can take place you must have created (or updated) your contact details in our control panel. You can have more than one contact for different purposes, however the contact marked as Primary will be used as the default for all new domain registrations. Contact details will be transferred as part of the domain transfer. Following any domain transfer you must check and confirm the contact details are correct. Some domains will require you to verify the new contact details, this is required by ICANN (global domain name regulator) and must be completed to avoid domain name suspension. Check contact details with current registrar. You must be able to receive email on the email address defined for the Admin contact of a domain. Please make sure the current details are accurate – you will need access to your current domain control panel to do this. If your current registrar also hosts email for your domain you will need to make alternative arrangements as most registrars will suspend services (website, email, etc.) as soon as the transfer process starts. A temporary email address on one of popular providers can be useful for this purpose. If you change your email provider then remember to also update the domain admin contact details accordingly. Please remember that transfers of .UK domain names to us are generally free of charge. However, there will be a transfer charge for all other domain names, the amount varies by domain name. Place an order for the domain name you want to transfer to us. Confirm your billing address and credit card details. Note we do not charge a transfer fee for domains ending in .UK – all other domains will incur a transfer fee which will typically be the same as the annual renewal price. Your will receive a confirmation email of your order. The exact location in the control panel varies by registrar but the option to change IPSTag will be labelled “Release Domain”, “Change Nominet Tag” or something similar. Once that change has been made the domain transfer will take place automatically. Disable auto renew (if set). Disable registrar lock (if set). Make a note of the authorisation (or EPP) code, e.g. Note – this code is required for the transfer to take place. We recommend copy and psting the code into a text editor. These codes are usually time limited so this is not a security risk. To repeat – you must have access to the email address specified in the domain contact details for the Admin contact. Verification emails will be sent to this address that require a response. Login to your dashboard (it not done so already). Shortly after the placing your domain transfer order the status will be Pending WHOIS data, e.g. click the link, enter the code (obtained from previous registrar) and click Confirm Transfer, e.g. If your code is accepted the status will change to Pending registry approval, e.g. Now … wait until email received from registry which should contain a “confirm or cancel transfer” link, e.g. Follow the link contained n the email and accept the transfer. Note that these transfers may take up to 5 days to complete. 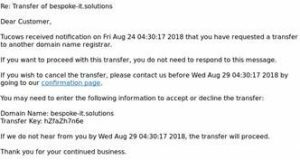 You will receive an email confirmation when the transfer is complete. At that time you should verify and correct (if necessary) your contact details, nameservers and DNS records. We can assist with that if needed. HTTPS, why do I need it? All animals featured on this site are ours, or very frequent visitors. None of the products or services offered for purchase on our website include any of the dogs! Neither are any of the dogs for sale.